For AZ08, Nikki and I tried to do something different. Something more, even. First, we stayed all weekend, and were in it for the long haul. Second, we cosplayed. And third, we got an Artist Alley table. 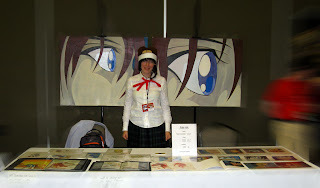 All of which was a lot more than we did on our first excursion to Animazement, the year before. 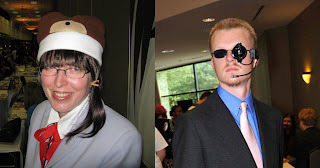 For costumes, we went as Lain and a Man in Black. We spend some time hunting down the appropriate clothing articles at thrift stores, and I certainly think we came close. Nikki managed to score a good skirt and jacket that was similar, though not an exact match, to that of Lain. Add to that a wig, which we cut ourselves, and we have a very good looking Lain Iwakura. For my costume, things were mostly pretty easy. A black suit, with a blue shirt and pink tie was simple enough. The prop "glasses" were more of a challenge. I used a simple pair of shades to start with, and made the eye piece out of various plastic parts. I also got a red led kit from RadioShack which completed the look and seemed to work pretty well. Granted, it wasn't an exact match either, but anyone who knew the character recognized me as such. The blinking led was also pretty eye catching. The biggest reason, however, for doing AZ for us, was running an art table. We knew that sales probably wouldn't be huge, but we had hoped that at least we could break even and pay for our purchases at the con. Sadly, that didn't happen. We learned all too quickly that the best selling items were fan art. We had very little of that. In fact, I'm not too keen on even doing much fan art to be honest. I'm not as much of an illustrator as I am a fine artist, which is why I don't think the con crowd is actually my target demographic. We did sell at least enough to pay for our con tickets. Another lesson learned was that running a table is pretty exhausting. We were there for three days, twelve hours a day. If you consider how much money we took in, and split it between two people, then we didn't even come close to getting minimum wage! Ah the joys of being an artist. Still, I won't say that I shouldn't have done it. It was a good learning experience, but above that it was actually fun too. I enjoyed myself, even if I was completely drained afterward. Image via Yamato USA [link]. On a more positive note, we managed to get some cool things as well. I scored an out of print Lain series guide, as well as some very affordable NGE Eva figurines. 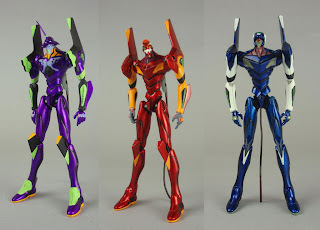 I wanted to get those Evas to draw from, as I don't expect them to really be worth much as a collectible in the future. I also got a good deal on the art book Warriors of Art: A Guide To Contemporary Japanese Artists, by Yumi Yamaguchi. I've had my eye on this title for some time, and was happy to see it at the con. Surprised even. 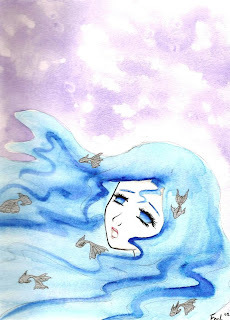 Water Girl, by OrShouldI [link]. Our other purchases included artwork by other artists at the con, with whom I am happy to say that we made friends with since, mostly on DeviantArt. We purchased a very nice watercolor piece by OrShouldI, as well as prints by Yanomeko, Avoice, and Coey. So thanks to all of you, for all the wonderful artwork, and hope to see you all next time. By the end of the whole ordeal, we realized that if we do repeat the art table endeavor, we'll have to probably alter our tactics somewhat. As I near the end of this post, I still need to mention one other thing. Which is that cosplayers were as always one of the highlights of the convention. We tried to take as many photos as possible, and have posted them in a flickr album as well. Check them out here. Thanks for all the memories, and let's see how the new convention center in Raleigh will change things in 2009.